The Israelites, no matter how hard they tried, were unfaithful God. God remained faithful and fulfilled the promises He made to them. Through His prophets, God made many promises. Isaiah 7:14 says, “Therefore the Lord himself shall give you a sign; Behold, a virgin shall conceive, and bear a son, and you shall call his name Emmanuel.” The name Emmanuel translates as “God with us.” It’s a remarkable promise - the Ultimate Being and Creator of the Universe promising to make Himself physically present with the people who have proven themselves unworthy. In one of the most somber Christmas songs, “O Come, O Come Emmanuel”, there is an embraced tension within Israel. They are in exile, separated from God yet again. With a sober perspective, they choose to rejoice in the promise God has made to them. With nothing else to cling to, in the midst of desperation and loneliness, they recall and proclaim the promise that God would be with them - knowing that, in spite of their unfaithfulness, God is faithful to His promises. No one could have expected a baby in a manger to be the start of God’s perfect plan to be “with us.” And yet, that is exactly how God fulfilled His promise. Are you waiting for God to come through on a promise He has made? Do you feel a sense of loneliness or exile? Rejoice! Rejoice! Through Christ, God has made Himself present to us. His faithfulness is greater than our failure. And His presence is all the reason we need to, once more, rejoice! 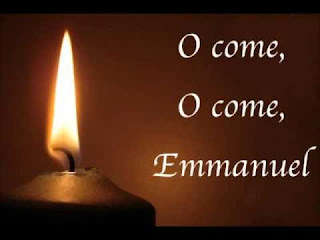 Since God is “Emmanuel,” how is God with you this Christmas season? Dear Lord, help us to be faithful to You in the things that we do. We thank You that You are faithful and always there even when we fail. In the Name of Jesus, Amen.